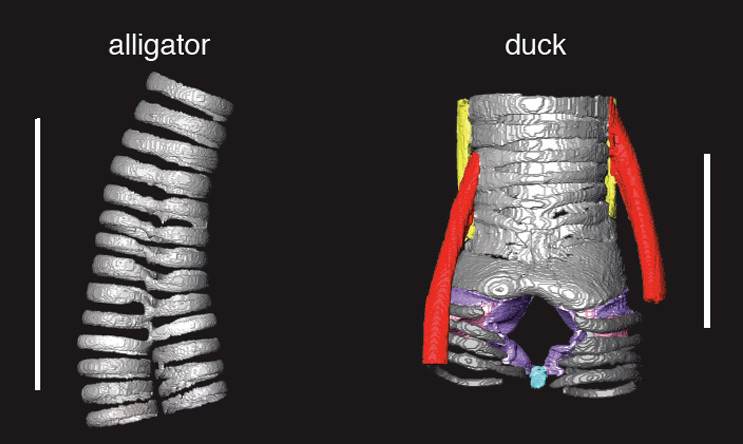 Computer models of the larynx of an alligator (left) and the syrinx of a duck. The 3D models were created using specimens that were scanned at the University of Texas High-Resolution CT Facility. Clarke et al. New interdisciplinary research suggests that this distinctly avian anatomy arose because birds, somewhere in their evolutionary history, opted for building a brand new vocal organ — the syrinx — instead of modifying an existing one that is present in an array of animals but silent in birds — the larynx. The researchers, a team of scientists including developmental biologists, paleontologists and evolutionary biologists, said that the evolution of the syrinx — which is unique to birds — raises questions about changes in bird vocalization over time and can help shed light on the mechanisms driving the development of new structures in animals. The syrinx is an especially interesting case because it is one of the rare instances in which a new structure evolved without serving a new function. The diverse team, including Evan Kingsley and Cliff Tabin from Harvard Medical School as well as UT affiliates Chad Eliason and Zhiheng Li, published their study in the journal Proceedings of the National Academy of Sciences on Sept. 24. The syrinx sits at the base of the windpipe near the heart in birds. The larynx is located above it within the windpipe. Whereas most land-dwelling animals with a backbone produce sounds with vocal folds within the larynx, birds don’t use it. Instead, birds create calls in the syrinx by passing air over soft tissues supported by cartilaginous rings. The study investigates how and why birds developed this completely new way of producing sound. 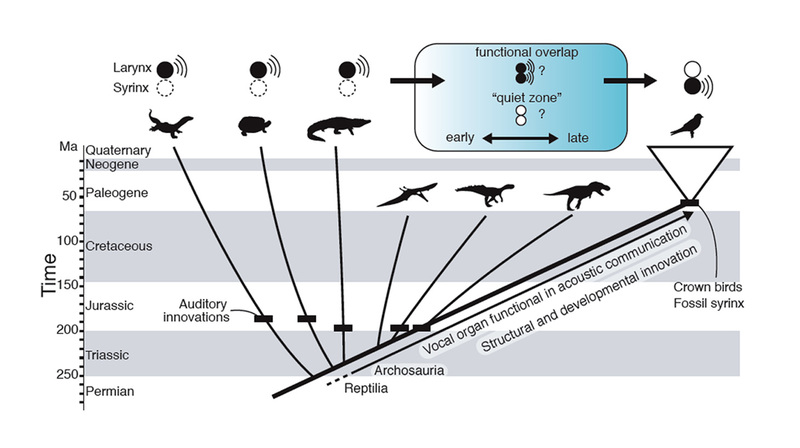 Some animals modify sounds produced by the larynx with the help of other structures. For example, male koalas have vocal folds above their larynx that create deep bellows, and toothed-whales can modify vocal sounds using folds in their nasal cavity. The researchers also explore an alternate scenario in which the larynx stopped working and the syrinx evolved to give the ancestors of modern birds their voice back. A chart illustrating the vocal organs and proposed vocal organs of bird ancestors and how they may have functioned (blue shaded box). Archosaurs, bird ancestors that include avian dinosaurs, may have had a larynx and syrinx that sounded together during an overlap period. Alternatively, the evolution of the syrinx may have ended a “quiet zone” where bird ancestors had no functional vocal organ. Understanding whether the shift to the syrinx occurred early or late in archosaur evolution will require further comparative genomic and paleontological work. Julia Clarke et al. “Instead of arising as an accompaniment, the syrinx evolved as a replacement noise-maker after the larynx lost its primary sound producing function, ending a potential ‘quiet zone’ in evolutionary history where bird ancestors didn’t make a peep,” said Eliason, a postdoctoral associate at the Field Museum of Natural History and a former Jackson School postdoctoral researcher. In addition to looking into the evolutionary environment, the team investigated the developmental history of the syrinx in comparison to the larynx. “Despite their related function, the syrinx and larynx have distinct developmental histories — forming from different tissues,” said Kingsley. The origin of a unique developmental path and novel bird organ could be linked to other amazing avian innovations — from the dawn of flight to the evolution of complex bird song and the development of long necks in extinct dinosaur ancestors of modern birds. “What we show about syrinx development suggests fundamental differences from the larynx and has important implications for how the enormous variation we see within birds in song and structure arose,” Kingsley said. “When we put this all into the context of biological novelty, we gain insight into how new structures and functions arise in the history of life,” Clarke said.